Frome’s Channel Challenge gets kitted out! FROME care home, Rossetti House, has sponsored the kit for the youngsters taking part in the Frome to France Channel Swim this September. 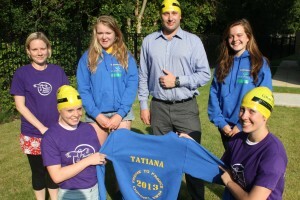 Mark Barnes, home manager, presented the hoodies and swimming hats to Ailsa Williams (14) Nicole Poole (15) Tatiana Hooper (14) Lucy White (14) in the gardens of Rossetti House on 9th July. The team, who are aiming to raise at least £1,000 each for their chosen charities PAC and Dorothy House, are mid-way through their training. They have just completed a gruelling two hour qualifying round in Weymouth where they swam without wetsuits in a rather fresh 16°C water. Ailsa Williams, whose idea it was to complete the challenge, is really pleased with how training was going. She said, “When we first started training the water was freezing – only 7°C but now the water is getting warmer it is becoming more manageable. “When we were training in Weymouth one of the coaches warned us to concentrate on our swimming and not worry about the crabs – but they were huge! One of the team swam down to the ocean bed and managed to catch one and take it home for their tea!